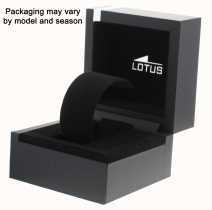 Authorised retailer for Lotus Watches. Free delivery, 30 day free returns and five-star rated service. Buy now with up to 12 months 0% finance. 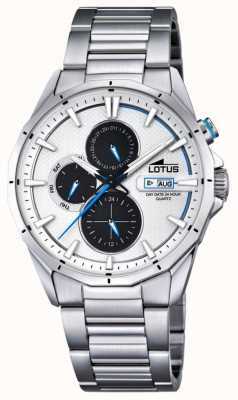 Lotus are known for making high quality watches with contemporary designs at incredibly affordable prices. Lotus watches are incredibly popular with over 1.3 million watches sold in Spain alone since their launch. Lotus watches have a very distinct style and a number of them, like the Lotus L18103/1 Gents Watch, have a strap which looks a lot like a car tyre. The unique style makes the watches in the Lotus range stand out amongst the crowd. Lotus was founded in 1980 by Spanish businessman Miguel Rodriguez, who had dreamed of owning his own watch brand. Miguel Rodriguez had always wanted to create modern, high-quality, affordable watches and the Lotus brand has gained a stellar reputation over the last 25 years for doing exactly that. In 1984 Miguel Rodriguez brought respected watch brand Festina and created the Festina Group. Lotus watches are exported all over the world and they continue to be incredibly popular, especially in Spain where Lotus are a market leader. You can find Lotus watches at all price ranges, but when you consider the incredible high quality of the watches in the Lotus range there is no doubt that they are incredibly affordable. With high quality designs and fantastic build quality of watches like the Lotus L18107/2 Gents Watch, which costs less than £100 right up to the impeccable Lotus 18230/1 Gents Watch, which still comes in at less than £500, you know what you will always get a high quality watch when you buy Lotus. Lotus watches are produced under the flag of the prestigious Festina Group, who have a top reputation for producing high quality, reliable watches. Lotus watches help extend that reputation with quality watches which you can always rely on, which is one reason why they have supplied watches to the Tour de France in previous years.